BDSwiss is a forex and binary options broker is involved in the business of offering the trading of forex, binary options and CFD contracts from a single platform. Thus, BDSwiss prides itself in offering all these financial markets from an “all-on-one” account. BDSwiss is an online brokerage platform which allows traders to trade forex and binary options. BD Swiss holds multiple licenses. BDSwiss is authorised and licensed by CySEC (EU) (License No. 199/13). This takes care of the European angle of its operations. As BDS Markets, the company is authorised and regulated as an Investment Dealer by the Mauritius Financial Services Commission (FSC) with licence no. C116016172. All brands are owned and operated by BDSwiss Holdings PLC, with headquarters in Cyprus. BDSwiss’s trading platform is web based and requires no software download or installation. The user interface is well designed and looks uncomplicated as well as slick. One of the main attractions of binary options is the fact that it is simple to understand and to trade with, a fact that is maintained with the way BDSwiss has designed their trading platform. The price chart is prominently displayed together with the expiry time ensuring that all the critical trade information are within sight. Once you have placed your trade, the price chart will be updated to show your position. Another plus point about BDSwiss’s trading platform is the fact that you can place multiple trades with the same chart. BDSwiss offers its binary options platforms as mobile apps as well. These can be downloaded from the Google Play store as well as the App store. 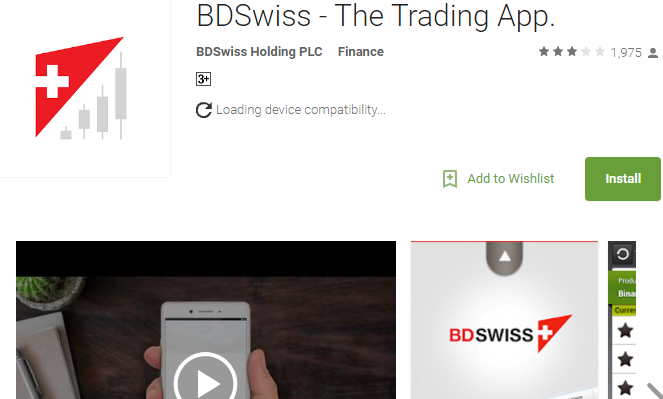 As at the time of writing this, the iOS version of the BDSwiss mobile app is still listed on the app store, despite Apple’s withdrawal of support for binary options mobile apps on its store. BDSwiss has several assets listed for trading. However, what can be traded depends on what kind of account is operated by the trader. For the BDSwiss Basic, the following assets are listed for trading. Currencies: AUD/CAD, AUD/CHF, AUD/JPY, AUD/NZD, AUD/USD, AUD/PLN, CAD/JPY, EUR/AUD, EUR/CAD, EUR/CHF, EUR/GBP, EUR/JPY, EUR/JPY FUTURE, EUR/NZD, EUR/RUB, EUR/USD, EUR/USD FUTURE, GBP/CAD, GBP/CHF, GBP/JPY, GBP/RUB, GBP/USD, GBP/USD FUTURE, NZD/JPY, NZD/USD, USD/CAD, USD/CHF, USD/JPY, USD/JPY FUTURE, USD/RUB, USD/SGD, USD/TRY, USD/ZAR. Indices: AUS_200, BEL_20, CAN_60, ESP_35, EUR_50, FRA_40, GBR_100, GER_30, GER_M50, GER_T30, HKG_50, HKG_CHN_HS, IND_50, ITA_40, JPN225, NAS100, NED_25, NOR_25, SPX500, SUI_20, US30, US_SMCAP_2K, ZAF_40. Commodities: Coffee, Gold, Gold Future, HGold/EUR, Oil (Light Sweet Crude), Oil Future, Platinum, Silver, Sugar. Treasuries: EUR_BOBL, EUR_BUND, EUR_BUXL, EUR_SCHA, EURIBOR, UK_GILT, UK_SH_STERL. For enhanced trader convenience, BDSwiss has the opportunity to run accounts in one out of several base currencies. These base currencies are the Euro (€), US Dollar ($), GBP (£), Polish Zloty (PLN or zł), the Danisk (DKK), Swedisk (SEK) and Norwegian (NOK) Crowns as well as the Swiss Franc (CHF). BDSwiss processes deposit card transactions instantly, and withdrawals within an hour, making it one of the brokers with the fastest withdrawal times. Bank wires are also allowed and they bring the advantage of being able to give a secure environment for deposits and withdrawals with no limits. Sadly, digital wallets are not yet accepted on the BDSwiss platform and this is considered a minus in today’s online brokerage business. The customer is withdrawing less than €100 / $100 / £100 when the account balance is more than 100 units of currency. No trade on deposited amount has been made. E-mail support is also provided, but is separated into several email channels to assist with specific issues. The general support email is [email protected]. Fax support is available at +49 (0)691 75 36 86 49. There is also an online contact form as well as a Live chat facility. BDSwiss offers the following resources and extra features for its clients. Intuitive Platforms with advanced charting tools to aid in technical analysis. A selection of more than 250 assets spread over leading exchanges in four asset classes: stocks, commodities, currencies and indices. Educational Resources to enable traders understand how the financial markets work. Resources provided include accredited trading courses and webinars. A fully multilingual customer support desk is available via email, phone or Live Chat. The customer support offering of BDSwiss is well above the industry standard and kudos must be given to BDSwiss for this. BDSwiss has an impressive offering, ensuring that traders have access to three different markets, all from one single platform. Well regulated binary options broker. Multilingual customer support available through multiple channels. One of the fastest brokers in terms of processing of withdrawals. Digital wallets are not supported. Most withdrawals are not free of charge. What Bonuses can I get with BDSwiss? Answer: BDSwiss offers a deposit bonus for first-time traders. The amount has to negotiated with the firm’s representative in charge of the trading account. For further information, you can contact customer support. What are the payment methods supported by BDSwiss? Answer: BDSwiss supports the use of credit and debit cards as well as bank transfers. You cannot use digital wallets on the BDSwiss platform. What is the minimum and maximum deposit requirement? Answer: The minimum deposit requirement is $/€200. There is no maximum limit on deposit transactions. Answer: All deposit transactions performed with cards are processed instantly. Withdrawal requests at BDSwiss are typically processed in one hour if cards are used. Bank wires are slower but typically faster than most binary options brokers, with processing time of 2 days observed in some countries. Is BDSwiss a safe broker to use? Answer: BDSwiss is regulated in two jurisdictions: Cyprus/EU by CySEC, and also in Mauritius by the FSC. This makes BDSwiss Holdings PLC highly accountable to regulators and their clients, ensuring that their brokerage brand is safe to use. Can I use a binary options robot on BDSwiss? Answer: Binary options robots are third party applications. There is presently no information on what robots work on the BDSwiss platform.